Max is hypermobile. So far in life, he’s seen only the upside of hypermobility: it makes climbing easier, he can get into impossible yoga positions, and he can fit into tiny spaces when playing hide and seek. But yesterday he experienced the downside of hypermobility. He tumbled when he was skiing, and in the process of righting himself he managed to kick his eye from behind with his own ski. 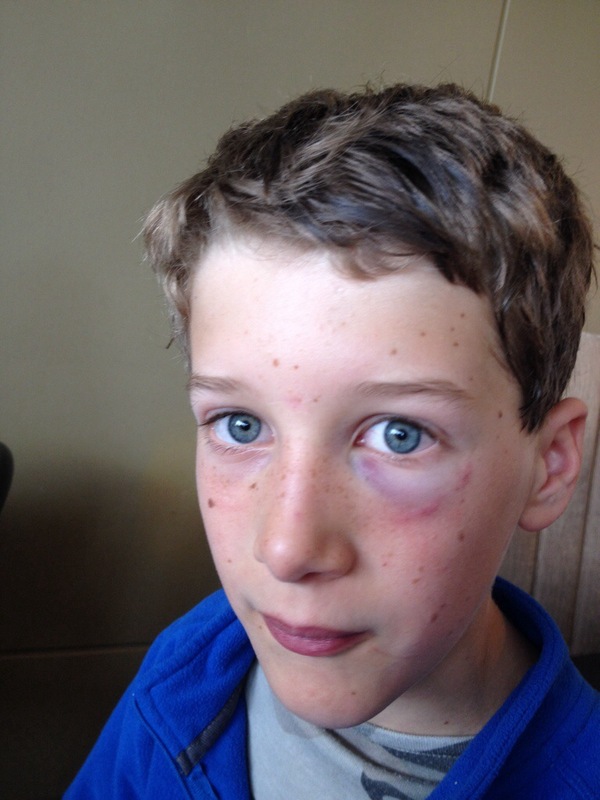 Today, the poor child has a nasty cut and a black eye. Wow, Max! That is quite a bruise. Hope it doesn’t hurt too much and that you can get back on the slopes. Nothing stops Max getting back on the slopes! He looks odd, but he’s right as rain. It’s a shame he was on both sides of the collision. Max says he can’t fake it: the ski won.